Child development experts and medical professionals agree that healthy lifestyle habits are learned behaviors most strongly influenced by the family. Researchers also concur that nutritional habits established in infancy and childhood set the stage for a lifetime of dietary patterns. A recent CDC report, for example, highlights the importance of eating practices in the first year of life. When children drink sugar-sweetened beverages during the first 12 months, this doubles the odds they will drink those beverages at age six. And limited fruit and vegetable consumption in the first year leads to limited fruits and vegetables at age six. Dietary preferences aren’t the only behaviors from home that carry over into adulthood with lingering epigenetic effects. 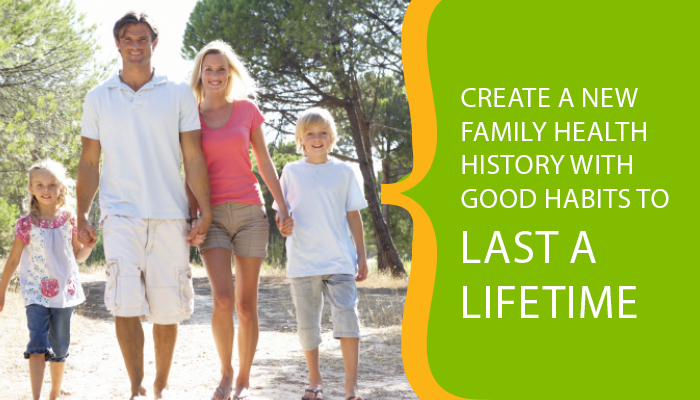 Stress management, sleep patterns and exercise are all influenced by family culture. Work, social activities, media and electronics compete for time that could be spent planning and preparing meals, engaging in physical activity or getting sufficient rest. Parents today work an average of three hours more per week than they did in the 1960s. That can mean the difference between home-cooked meals and picking up take-away. Raising healthy kids today can feel like climbing Mt. Everest. But it can be done! It all starts when you embrace health as a family. 1) Be a good role model. You don’t have to be perfect, but if kids see you trying to eat right and exercise, they will take notice. 2) Get the family moving together. Take walks, ride bikes, go swimming, garden or just play hide-and-seek outside. Everyone will benefit from the exercise and time together. 3) Limit TV, video games and computer time. These habits encourage a sedentary lifestyle and contribute to excessive snacking. 4) Encourage physical activities that they enjoy. Let your child experience different activities. Be creative and incorporate exercise into everyday situations. 5) Pick truly rewarding rewards. Resist the urge to reward kids with TV, video games, lollies or snacks. 6) Make dinnertime a family time. Get your kids involved in cooking and planning meals. No TV or portable media devices during dinner (that includes YOUR phone). 7) Make a game of reading food labels. The whole family will become more conscious of what they eat — a habit that can change behaviour for a lifetime. 8) Make healthy food choices easy. Save countertops, front-of-fridge and lower shelves for fruits, vegetables and healthy snacks. Provide a variety of choices. You might be surprised at what they like! 9) Limit sugary beverages. Beware of sugar-laden drinks marketed as juice beverages. Check the ingredient labels and serving sizes. 10) Stay involved. Be an advocate for healthier children. Insist on good food choices at school and other social settings. Healthy families don’t happen overnight, so set realistic goals when adopting new behaviours. Pick one strategy and allow time for kids to adjust. Small steps and gradual changes can make a big difference in your health over time and in the health of your kids over their lifetime! LunaRich®: Reliv’s exclusive epigenetic superfood proven to support innate immunity and overall cellular health. Posted in Health and tagged Epigenetics, family, health, Kids, Reliv.